Renowned photographer Hiroshi Sugimoto has increasingly turned his attention to architecture. For Current Work, he will discuss four design projects. Commissioned to restore the 15th-century Go-Oh Shrine in Naoshima, Japan, he created what he describes as “an imaginary architecture” that pays homage to Shinto tradition. 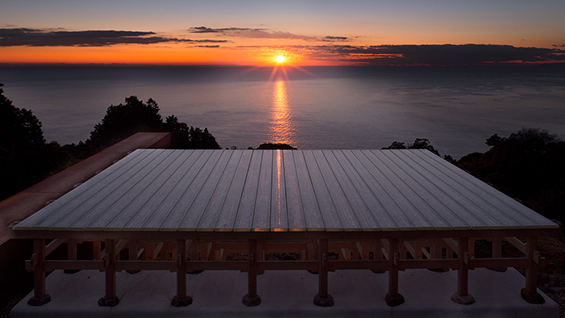 Enoura Observatory, the home of a cultural foundation Sugimoto started in 2009, doubles as an observatory for viewing the summer and winter solstices. Surface of Revolution, an exhibition in the gardens of the Palace of Versailles which will run from October 2018 to January 2019. Private Residence in Manhattan, a project in New York City. Born in Japan, Sugimoto moved to the US to study photography in 1970; within a few years his work was being shown at the Museum of Modern Art. In the decades since, his photographs have been acquired by the Metropolitan Museum of Art, the Smithsonian, the Tate Gallery, and many others. In 2008, he founded design firm New Material Research Laboratory (NMRL) with architect Tomoyuki Sakakida. The office has worked with a number of cultural institutions, completing projects such as the lobby of Washington DC’s Hirshhorn Museum and the atrium garden of New York’s Japan Society. Sugimoto has won the Praemium Imperiale Award for Painting and the National Arts Club Medal of Honor in Photography, among many other accolades. The lecture will be followed by a conversation with Billie Tsien, cofounder of Tod Williams Billie Tsien Architects | Partners.